The model initialization action opens a dialog to define the target directory for the models. You can initialize the models in another project than the EMF model project. A good project for the EEF models (and code) is the EMF.edit project of your meta-model. In the EEFGen created, the generation directory is a "src-gen" folder in the project where this model. You can keep this value or choose another folder. In any case, the target folder must exist and be a source folder. If the folder doesn't exist, you can create it with the "File > New > Source folder" wizard. If the folder exist but isn't a source folder, you can configure the build path of the project with the menu "Right click > Build Path > Use a source folder". Don't forget to add this new source folder in the build.properties file ! For an optimal course of the generation process, you have to add a dependency to the EEF Runtime project. 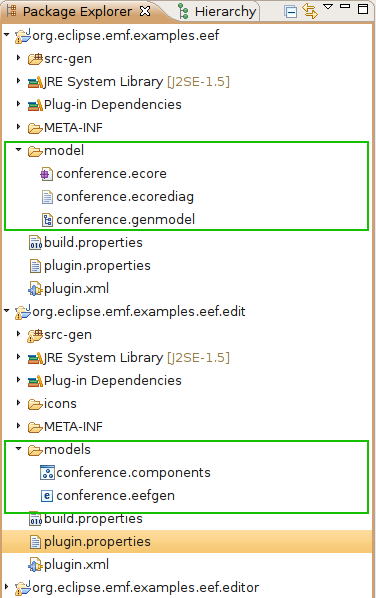 To do that, open the plugin.xml file and add a dependency to the bundle "org.eclipse.emf.eef.runtime" in the "Dependencies" tab. Reexport this dependency to use the EEF runtime classes in the ".editor" project of your meta-model. Once these steps done, generation can be called with the action "Generate EEF Architecture", just right click on the EEFGen model. Global providers are also generated. They defined the structure instantiation and the elements edition strategies. Three providers have to be declared in the plugin.xml file with the extension points defined by the EEF runtime (explained in the next part : #EEF generation with EMF treeview editor). On the runtime tab, add the "providers" (with a final "s") in the exported packages list. EEF provides 3 extensions points that are needed to use the generated code with any EMF edit. These extensions point are declared in the EEF runtime, so you need to add a dependency on it. The generation produce a partial plugin.xml that you can use to fill your own plugin.xml with. It is located in the generation root folder and is named like "XXX_properties.plugin.xml". You need also to declare properties views in the edit project. This extension point is provided by the eclipse platform, and is needed to show up the EEF views in the properties view. the generated properties file ( XXX_properties.plugin.xml ) contains all the necessary code to declare the properties views, so you can copy/paste the contents in your plugin.xml file. The editor must implement an additional interface : "org.eclipse.ui.views.properties.tabbed.ITabbedPropertySheetPageContributor". Use "@implements ITabbedPropertySheetPageContributor" in between the user section (html comments) in the Javadoc at the class definition to keep the next code regeneration from reverting the change. * This is the property sheet page. Note that an OpenTransactionalWizardOnDoubleClick class exists in case you want to use a TransactionalEditingDomain. This page was last modified 04:06, 24 October 2016 by Stephane Begaudeau. Based on work by Goulwen Le Fur, Stéphane Thibaudeau and Frederic Madiot and others.